Many high school students try to think like a college admissions officer when beginning the admissions process. What are the admissions officers looking for in my essay? What will make me stand out from the crowd? If you’re trying to get inside the heads of college admissions officers, you’ve come to the right place. 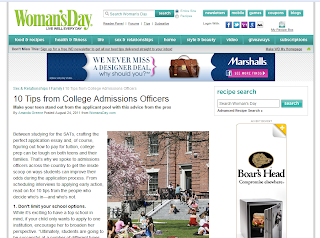 Amanda Greene recently wrote an article for Woman’s Day, sharing advice for teens from college admissions officers around the country. I was one of the admissions officers she talked to for her article, and she included several of my insights. After giving the Woman’s Day article a read, feel free to post any questions you have here. I’m happy to answer them.